Conversation is not communication | The science of enterprise—and doing good. Conversation is co-ordination not communication. 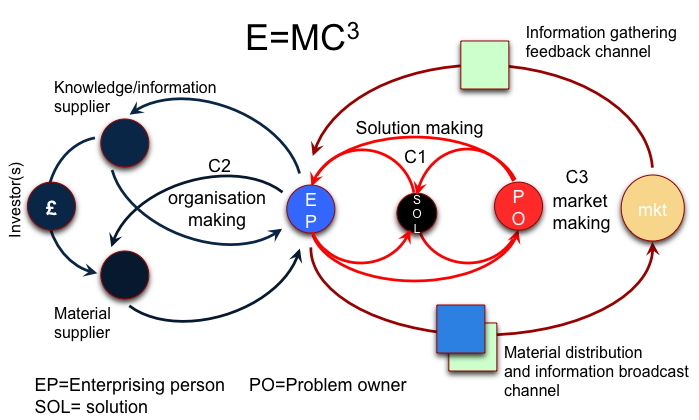 This is the point where e=mc3 (cubed) really begins to depart from the normal approach to innovating, creativity, small business and organisation development. Conversing is the most important activity you will ever engage in. You live—I live—everyone lives in language. I am a proponent, a fan (as in fanatic), of the work of two biologists Humberto Maturana and (the late) Francisco Varela. They have attempted to explain the dynamics of human social systems as systems constituted by individual living systems (e.g., us Homo sapiens). For example, this would lead to the conclusion there’s no such thing as a learning organisation, only an organisation of ( a ‘co-ordination of’ perhaps?) individual learners. There are supposedly two things that set humans apart from other animals. They are: our immense capacity for inventing and using tools, and language. I’ve put emphasis on inventing because that’s really what sets us apart, but tools are just one kind of thing we have invented. When Steve Blank says to successfully start a business you have to get out of the building, what do you think he’s getting at? Going for a walk in the park to fill your lungs with fresh air and your head with fresh ideas? No, of course not. What he means is get out and talk to people who might have a problem you might be able to solve. In other words he’s saying go start a conversation with prospective customers. Talking to prospective customers is the first of three domains or spheres of conversation. The general description and the result sought from each of the three is given here. What I want to do here is explain what conversation is really all about. Common wisdom says that language is a means of communication—but it’s not that simple. According to Humberto Maturana, and an increasing number of others, language is a means of co-ordination, and so is a means of collaboration, of co-operation, and, therefore, a means of co-design, and co-creation. Language, or more specifically, conversation, is not about transferring information or knowledge, and neither is the brain a device for receiving, decoding, recoding and sending data/information/knowledge, nor does it work like a computer to process ‘information’. These latter details need not concern us right now. What I want to get across here is that through language we establish domains of collaboration—like social systems, groups, teams and partnerships. It’s not language per se that has given our species a huge evolutionary advantage, but our massive capacity for co-operation it enables. If you’re not engaged in conversation, you’re not in the human race. We can only really achieve anything with others, and for mutual benefit(s). And, even when we are on our own, we are usually thinking of others, or our relationships with others, or rehearsing conversations we anticipate having with others, or repeating ones we have already had wishing we had said something different. For more on conversations and business by Humberto Maturana see the SOL publication Reflection, esp. The Biology of Business: Transformation Through Conservation. There’s an increasing amount of evidence of limits to the number of people who can work together. A great proportion of this has come from the evolutionary biologist Robin Dunbar who says the maximum number of humans who can work together is 150. More specifically, this is the maximum number of people we can relate to in a meaningful way. This is known as Dunbar’s number. If you are in anyway interested in online gaming (e.g., Warcraft) then you’ll be familiar with it. There are other interesting numbers too, 5, 12, 35, 70. For example, 35 is a great number for a hunting party, and also (maybe?) just the right number for a manageable small business. We humans have the biggest brains and somehow this allows us to collaborate in the largest groups of all animals. It seems that this extra brain capacity has allowed us to develop what we call language, the ability to co-ordinate actions with others through a mix of sounds (that’s what words are), and gestures. In fact, anything we can distinguish with our senses becomes a means of co-ordinating actions with others. If you are walking along a street with someone and you smell something really bad, what happens? You probably say: Yukk can you smell that? That’s a question: it’s an invitation to respond. They say, yes, and then you agree implicitly or explicitly to walk on the other side of the street. In other words, sensing and naming a bad smell has triggered a conversation leading to a co-ordinated action to avoid it. You can probably think of more examples. Now all this may appear far-fetched to you, so let’s bring it down to earth. If I’m the leader of a team and I allocate each member a task, then I will appear to be transferring a piece of information that each acts on. However, my real intention is to establish a pattern of co-ordinated working. Having a conversation is a way of assuring that when I’m doing the tasks I’ve set for myself, the others are doing theirs and so contributing to the team’s goals or core purpose (see CATWOE for more on core-purpose). That core-purpose (also a shared goal or objective) is the anchor point for a network or web of relationships, which is the team. The web can be spun and strengthened by having conversations, but it can also be undone too. How does this apply to Lean Startup? The first conversation in the E=MC 3 (cubed) model of the Lean Startup process is with the prospective customer who owns a problem you think you might be able to solve. Emerging from that conversation is, first, the definition of their problem. Further conversations lead, hopefully, to a solution concept. But because we cannot truly transfer information or knowledge to one another as we would an e.mail, both the problem and solution would be taken-to-be-shared. The figure below is an attempt to capture what happens during that first conversation. What you see is two people with independent thoughts going into the conversation. Moving in time from left to right, a solution gradually emerges. That’s great because the solution is the foundation of your new business, and a subject of future conversations through which it (your business and the solutiion) will evolve. The important outcome from a conversational point of view is that the solution now anchors your relationship with the problem owner and potential customer. You and your problem owner can now co-ordinate future actions using the solution concept. They could say to you: Have you got me a working prototype of that solution WE came up with yet? Asking that question they invite your attention. If they succeed in getting it they have re-orientated you. (You could also say they have manipulated you. ) They have extracted you from whatever activity you were doing and now you are co-ordinating with them on planning the next stage of the solution making process. Now we have a better understanding of why ‘getting out of the building’ is good advice, here’s a list things about conversation you need to appreciate. Conversation is not about communication, but c0-ordination. Conversation is a relationship building process (but it could have the opposite effect so be careful). Conversation is a problem discovery, defining, and solution making process. Conversation is a learning process, even if it fails to get you what you want. Conversation is a double-edged sword. It can create relationships, it can also destroy them. Conversations are difficult to control, the outcomes are unpredictable, this is because they are nonlinear recursive processes. For the same reason, conversations are a source of creativity or, as as I prefer, inventiveness. Although it’s not covered here, not yet anyway, last but not least is….. Conversation is an emotioning process. It’s a roller coaster ride of emotions. More here. Now we’ve briefly looked at Conversation 1 of E=MC3(cubed) what about the others? Below is the diagram I hope everyone will become familiar with. Conversing as managing, co-ordinating, and system building. In essence, this is a conversational model of problem solving, doing good, and enterprise/system creation. Conversations are punctuated by results. A solution is a result, gaining a customer is a result, a relationship with a prospective supplier is a result. I think it’s pretty easy from this to see why treating conversing as a process of co-ordinating is important. Conversation 2 (left hand side of the diagram above) is about bringing together a group of resources to realise the solution. This time the solution is the means of triggering a conversation with holders of the resources you think you need. If the conversations proceed in the way you anticipate, the solution becomes the anchor for a wider network of relationships, a web of relationships if you like, which, on further conversations, will become ever stronger to the point where you can say you have structure. In fact this is a system for realising the solution. This structure, loosely coupled to begin with, with weak ties, can become stronger, to the point where an organisation is created (a business entity). However, conversations can also blow relationships apart. There might be another reason why conversation 2 fails to lead to a coherent solution delivery system—that the solution is weak. At which point you might have to ‘pivot’. Pivoting is part and parcel of the learning process, of the process of experimenting which is at the heart of the Lean Startup approach, especially as described by Eric Ries. You can learn more about pivoting in the video. Let’s go to conversation 3. This is really about extending conversation 1 by using the solution to trigger a bigger network of conversations that could be equated to a marketplace. If you were really successful it’s very unlikely that you would be able to have the same kind of relationship with problem owners as came out of conversation 1, but should this stop you trying? The answer to that question is ‘it depends’. If your solution is very expensive, then you’ll probably have a relatively small number of customers (or prospective customers), in which case it will be easier to get to know them really well and build strong relationships with. On the other hand, if you are selling the equivalent of a standard can of baked beans you would have great number of customers (remember mass production requires mass consumption) and extremely weak, if any, relationship with them. However, you could set up small groups (5, 12, 35? ), drawing on what you know about group dynamics from the social brain hypothesis (which by now you will have ‘yahoooooed’) to get feedback on your products, services, or future offerings. Before leaving conversation 3, what about advertising and promotions, how do they figure in this conversational model? Advertising and promotions will almost certainly feature a problem and the solution you are offering to it. This is really a question: Do you have this problem? If so, we have the solution. Advertising is seeking attention of prospective customers. It’s orientation again, but it’s also about drawing prospective customers into a conversation with you directly or your agents (e.g., retailers who sell your product). Once engaged the objective is to co-ordinate their activities to the point where they are willing to make an exchange—your product/solution for their money. That’s it for now. There will be supplementary blogs on conversation so look out for them, or subscribe. The focus on conversations with prospects and customers is wise but I do not necessarily believe that is always the place to start. It assumes that you always know who the customers are to speak to. Not every marketing situation can be solved by ‘getting out of the office’ and speaking to a few people in coffee shops which often seems to be the simplistic evangelising of Lean Start Up. Marketing has to be about serving customers profitably and the criticism that I hear from many marketers I know is that too often, genuinely delighting customers and building a brand seems secondary in a Lean Start Up approach. I have been to many digital start up events where the fi conversations they have are dominated by discussions on investment rounds and exit strategies rather than building a real business that serves. Lean Start Up and Business Canvas are useful tools ( I refer to the texts in workshops and lectures that I do) – but they are not the entire solution. Marketers still need to understand value chain, competitor analysis, alternatives and substitutes. And – look to delight customers, not just see them as a means to make a few extra quid. Nice website and look forward to reading more of your stuff. Hi Andy, Nice to hear from you. Thanks for the comments. I am following the principles of lean startup but hardly simplistically. Famously, inventors invent things that no-one wants, because they have not validated their ideas with prospective customers and this is the situation that Lean start up is designed to avoid. And I agree with the approach. As to whether its partners first or prospective customers. Elesewhere on the blog I put forward the E=mc3 model. Soon after, or even as you are conversing with a prospective customer/problem owner, I’m certain that would-be problem solvers would be thinking about other people in their network who might be able to help solve the problem. As to whether lean start up is THE solution. I think what lean startup is is primarily a process model, which is a tool in itself. We can add tools at various stages. The business canvas for example is one such tool, without which I guess Lean startup ‘movement’ would not have taken off in the way it has (although UK universities seem to have missed the boat). Lean start purists (mostly would be so-called digital entrepreneurs) want nothing to do with what they might conceive as ‘old school’ but I don’t agree at all. I’ve said somewhere on the blog that there’s nothing new in lean startup, it’s just the way it has come together in a certain combinations of differently presented ideas (rather than brand new ones). That’s why I’m trying to retrofit Lean with other tools on business development here.